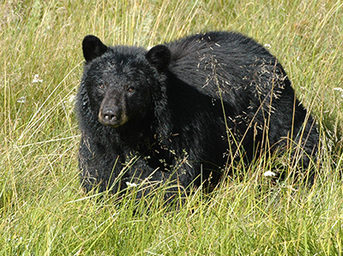 SANTA FE – Spring is in the air, and as people and wildlife become more active outdoors the New Mexico Department of Game and Fish is encouraging everyone to be aware of the potential of encountering bears and other native wildlife. Young bears are emerging from hibernation and will be foraging and seeking territory to call their own, said Rick Winslow, the department’s bear and cougar biologist. Sows with cubs will follow later in May. Those living in urban-wildland interface areas such as the foothills around Santa Fe or Albuquerque may have a greater chance of encountering bears, Winslow said. If a bear exhibits aggressive or strange behavior, people are encouraged to call the department and report it. Bears that appear to be moving through the country should be left alone – no need to report them. Stop, and back away slowly while facing the bear. Avoid direct eye contact, as the bear may consider that a threat. Do not run.